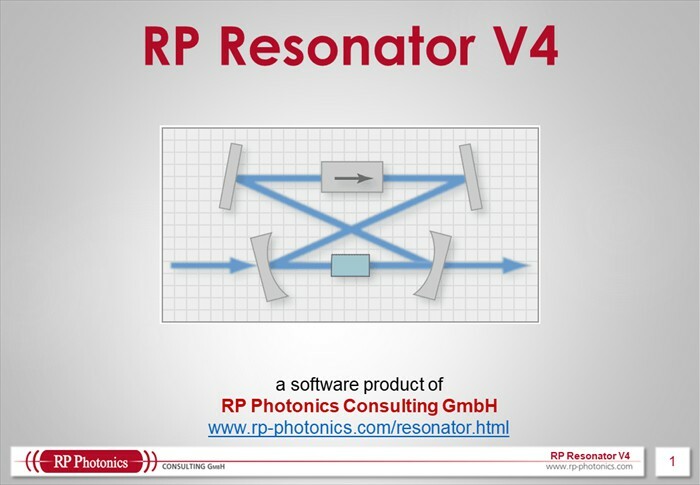 RP Resonator V4 is a powerful software for calculations on optical resonators. 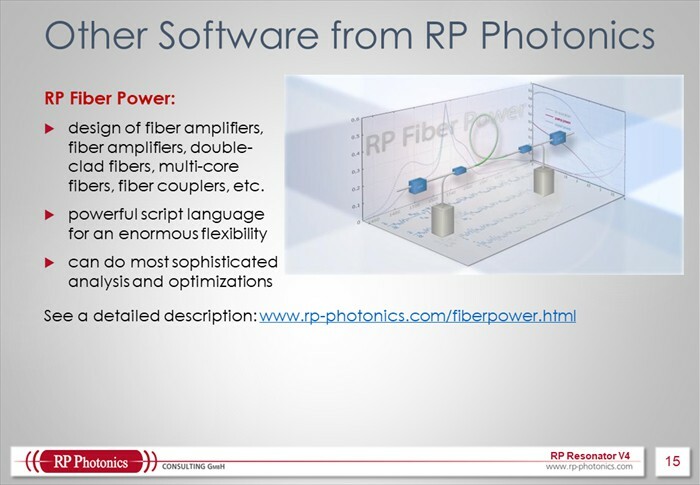 In particular, it can be used to produce optimized laser resonator designs. 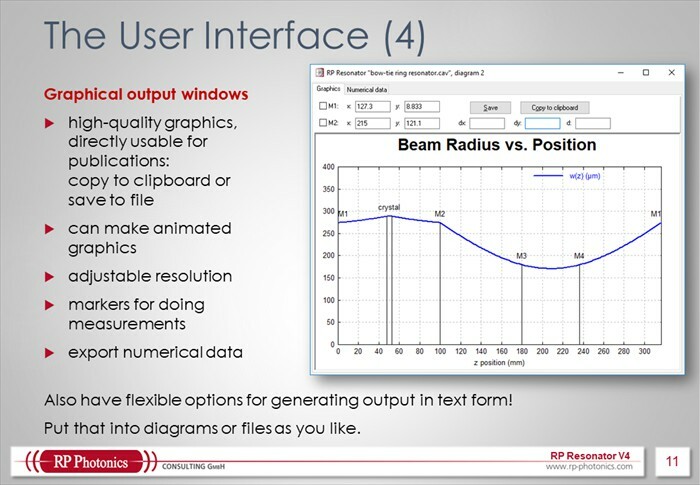 Its user interface combines uttermost flexibility with an easy start, making the software suitable for quick calculations in an industrial environment as well as for advanced research. Don't waste your time with some free resonator design software from questionable sources – professional work becomes effective and efficient only with high-quality software tools. When executing the calculation, you get various diagrams (not shown here). You can also get outputs displayed in the form. Further numerical outputs can appear in the output area on the right side. A great feature is that those forms and calculations are not hard-wired: you obtain script files, in which you can easily modify the forms and calculations according to your specific needs! 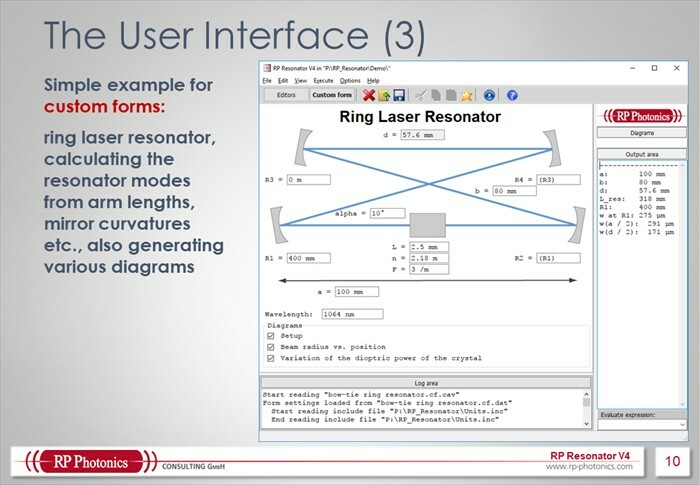 For example, you may introduce more optical elements to the resonator or create additional diagrams. And in case that things are getting too difficult for you, you will get very helpful technical support. You can get even complete new scripts made according to your informal description of what you need. Scripting is Highly Flexible – and Easy! Various parameter values such as the arm lengths a and b have been assigned to variables (not shown here), and the arm length d has been calculated from those, using a simple trigonometric expression. Generate other graphical diagrams for visualizing properties of your resonator or whatever else. Define a figure-of-merit function as a precise definition of your optimization target, and do a numerical optimization of some resonator parameters such that the value of that function becomes minimal. Save any calculated data in a text file or binary file – essentially any file format can be generated. 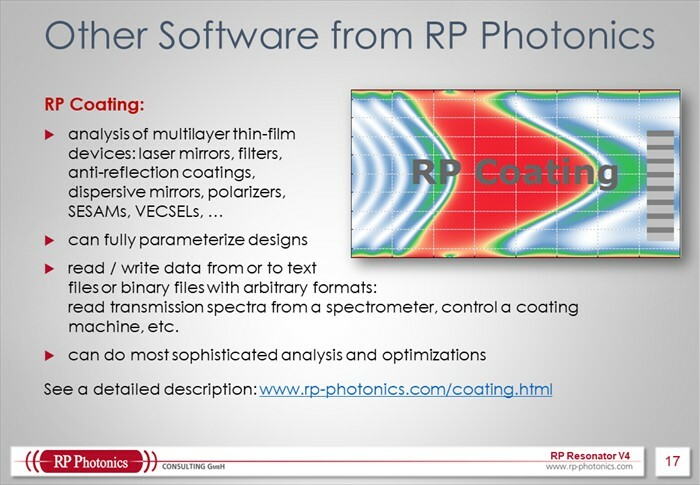 Which other resonator design software offers such an enormous flexibility? 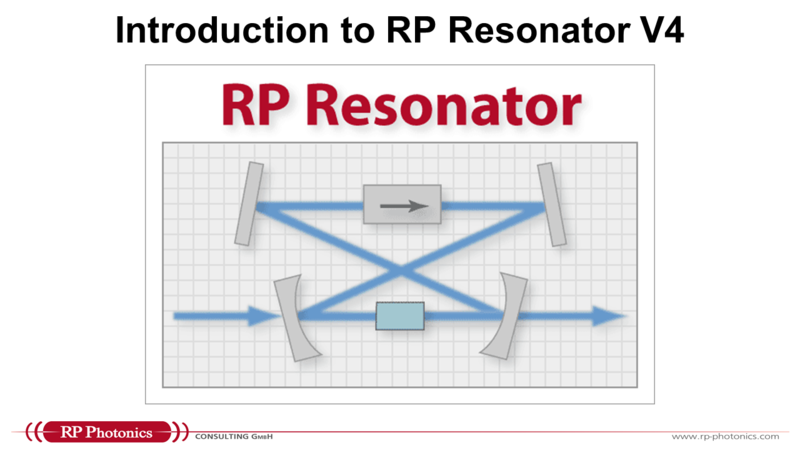 Compared with other resonator design software, RP Resonator is far more flexible. 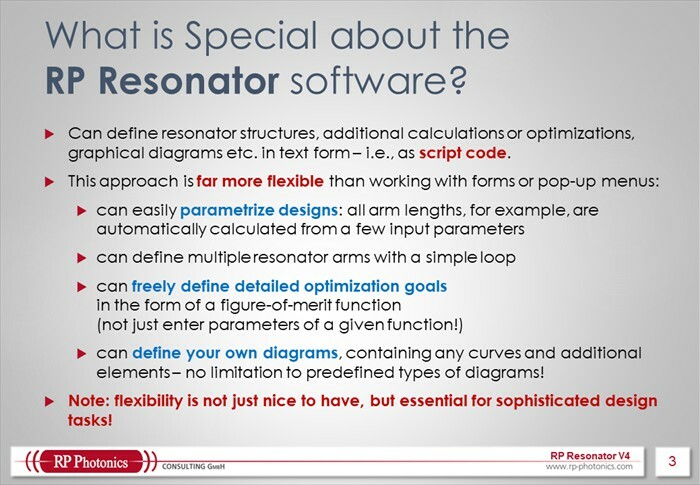 For example, you can have any parameters of the resonator setup calculated using some mathematical expressions. You can even generate resonator components within loops, so that by changing a single parameter you can even modify the number of components in your setup. (For example, you could state that you want sequence of N crystals with some air spaces and lenses or mirrors in between.) 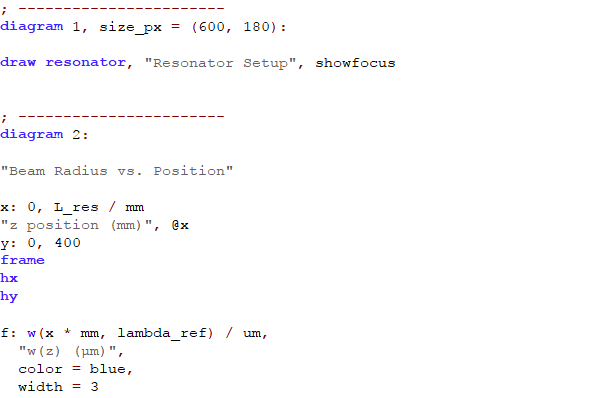 Also, you can automatically optimize resonator parameters such that a freely defined figure of merit is minimized. For complex resonator design tasks, such functionality is not just nice to have, but essential. Note that you can flip the pages by clicking on the left or right side of the brochure display. You can also download our brochure in PDF format. 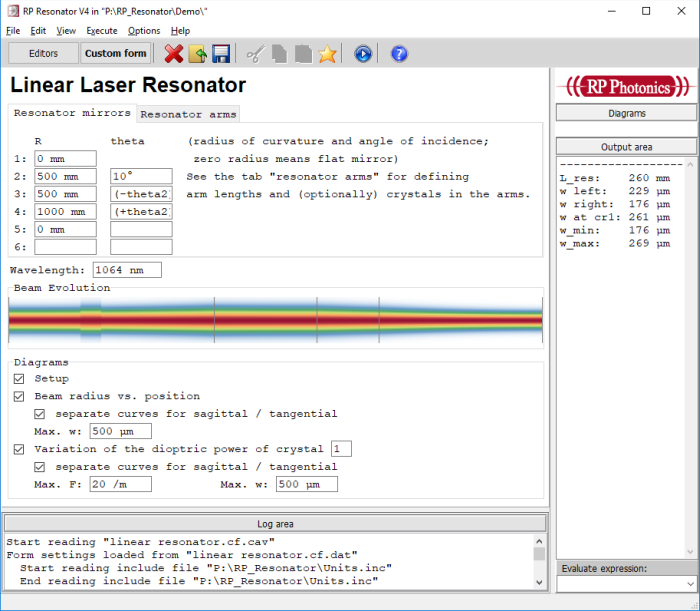 RP Resonator can calculate a wide range of properties of optical resonators, such as the variation of the beam radius, the sensitivity of the resonator mode e.g. to thermal lensing and misalignment, chromatic dispersion from geometric effects, Gouy phase shifts, frequency degeneracies of resonator modes, etc. It also facilitates sophisticated design optimizations. A figure of merit of arbitrary kind can be easily defined, and refined algorithms are used for minimizing this figure of merit by adjusting selected resonator properties. If necessary, arbitrary boundary conditions can be observed such as preserving certain symmetries, limiting the difference of certain quantities, etc. The software can draw the resonator setup and provide basically arbitrary plots showing all its properties. The software has a very versatile user interface. 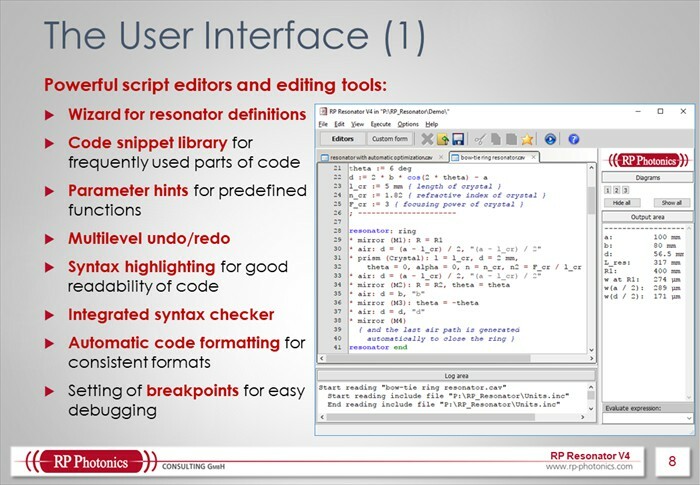 It is controlled with a powerful script language. 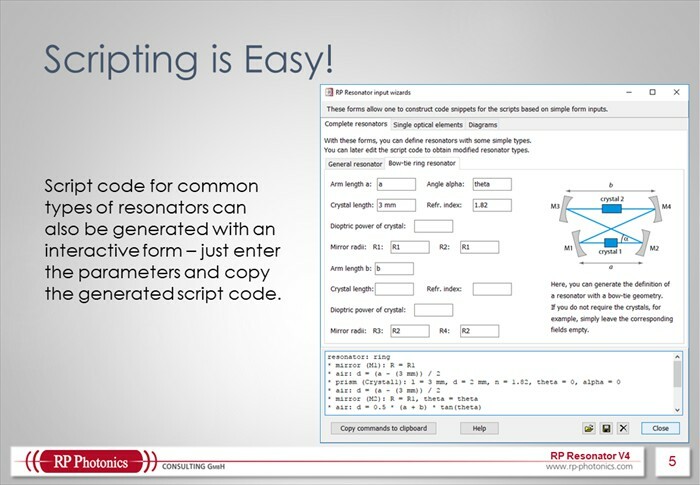 In addition, it offers an input wizards form, where one can generate large parts of the required script code simply by filling out forms. Just type numbers or even mathematical expressions into the form fields, and you instantly see the corresponding script code being generated. It is also possible to make custom forms, i.e., forms tailored to specific applications – made by yourself or within the technical support. Due to the script language, you obtain an enormous flexibility. 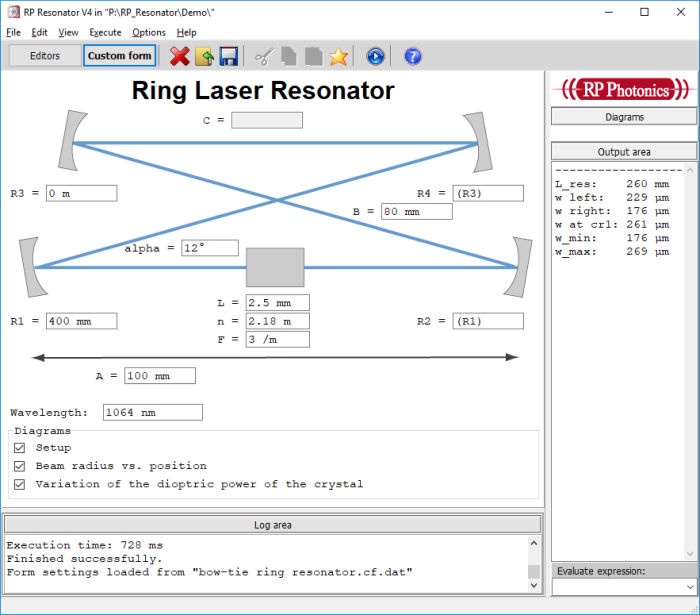 For example, you can define a resonator model where you have multiple passes through a laser crystal, and the detailed arm lengths and angles are calculated automatically from a few given parameters. 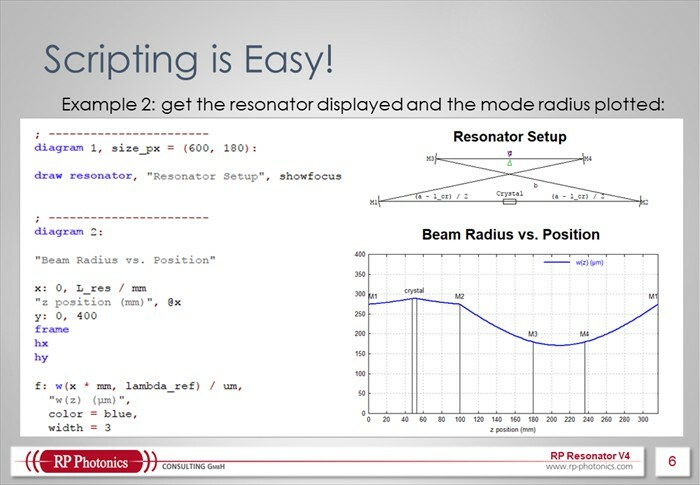 Then you can optimize the resonator by manually or automatically adjusting these parameters. 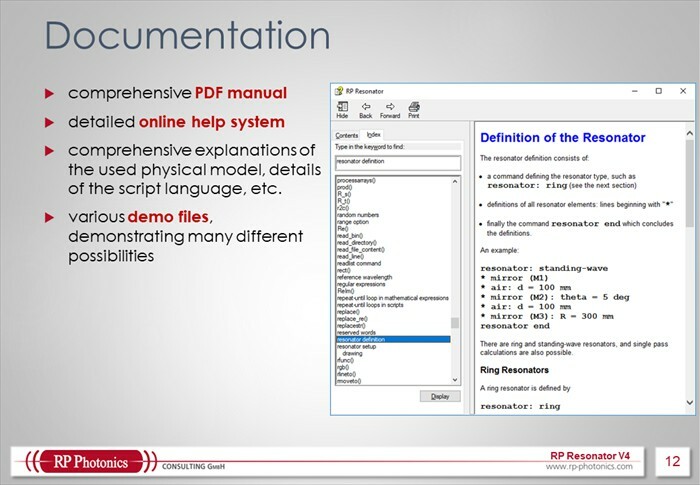 In addition to the detailed PDF manual, there is an extensive context-sensitive online help system. Having these features, the software can be applied in a great variety of cases. The probably most important application is the design of laser resonators. Some examples are shown as demos. 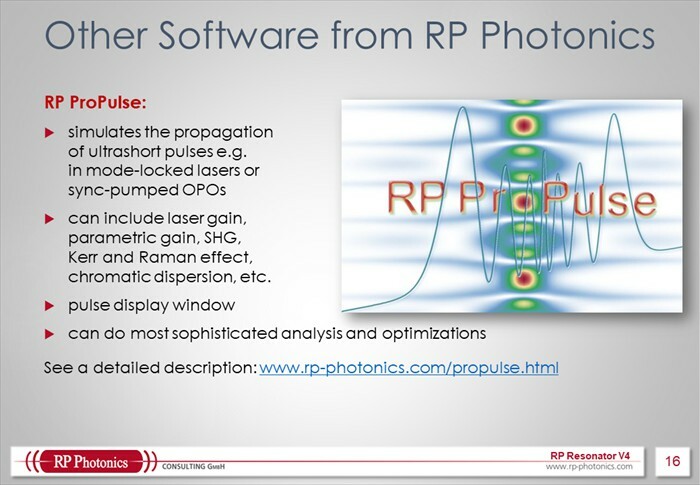 Another important aspect of this software: you can verify that its developer surely understands the involved physics and knows the scientific literature. He will be the person who makes sure that any problem you may have with using the software will be solved very soon. 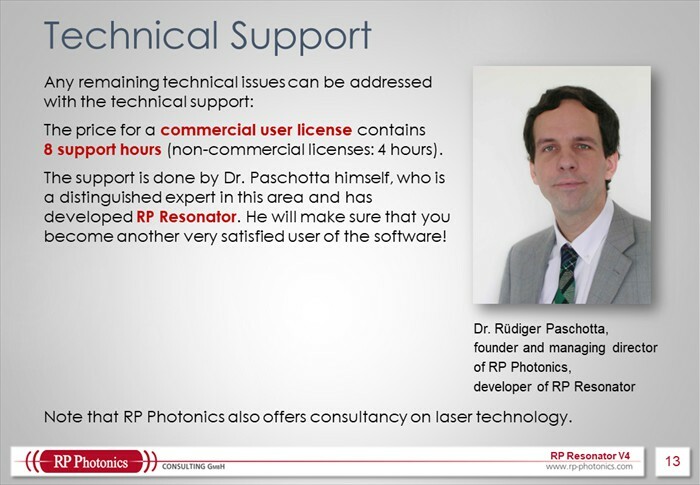 Substantial technical support – also usable for more general consultancy on related technical matters! – is included in the license fee. The powerful combination of software and competent support helps you to achieve fast and very efficient progress in your development projects.